When seeking the best wedding photographers in Orange County, it's important to look for skill in capture, composition, lighting and post production. For this portrait of a bride and groom at Hotel Seven4One in Laguna Beach, I decided that a two-tier pose would make for a more interesting image. We thus helped the bride climb up into an exterior window and once she had her balance, I leaned the groom up against one side of the window frame. By taking a low angle, I was able to also catch the sky reflecting in the window. Creative Photoshop helped brighten colors and remove the power lines that were reflected in the window, and the end result is a beautiful portrait that utilizes color, creative posing and attitude. This couple had a fun wedding cake made of glazed donuts with two rubber ducks on top. The groom was also super emotional throughout his wedding day, and cried when he first saw his bride walking down the aisle. It's such an honor to be able to photograph weddings where the love between a couple is so clearly evident. 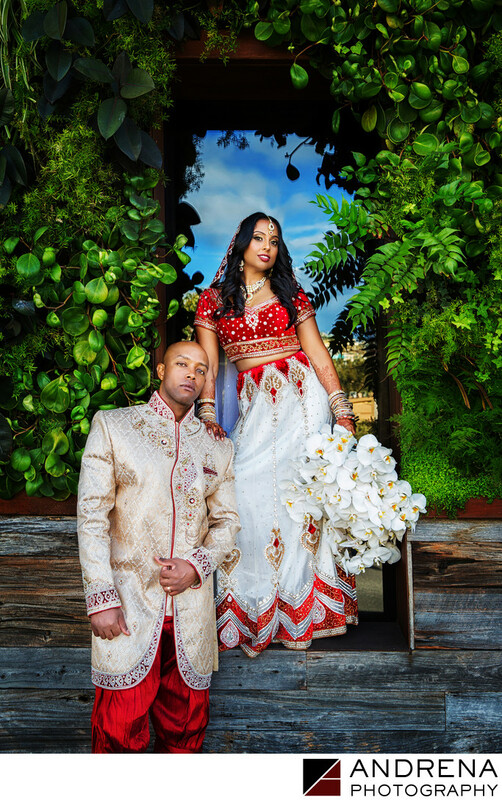 This stylish and editorial-style portrait was their favorite from their wedding day. Check out the bride's stunning bouquet.